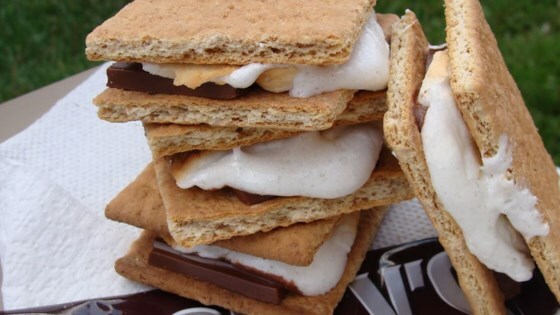 "Graham crackers with melted marshmallows and chocolate. Prepared over an open flame, this camping favorite is great for the holidays, too. Not recommended for the stove top." These are always a great idea! My oldest son's favorite variation is to use a peanut butter cup instead of a chocolate bar. These are sooo good! I also have been known to make "indoor s'mores" when I have to by using the oven or microwave, but roasting the marshmallow over fire puts these over the top! Nothing beats a real s'more, when you've got a fire to toast the marshmallows. In a pinch, I've been known to toast the marshmallows over one of the burners on our gas range! These have been a favorite for bonfires and cookouts for decades. For a treat in the winter, you can make these in the microwave. Just heat until the marsmallow begins to expand. A campfire tradition! I've tried it with different types of chocolate (rosebuds, chocolate chips, different candy bars) but plain milk chocolate candy bars are the best.